+1d6+1d4 x1/+3, When used in the course of one's soldierly duties, provides afore listed bonus to one's efforts (map & navigation, escape & evasion, first aid, food identification, etc.). The 'werewolf' and the 'wolf-man' were still rampaging through the tavern and healer's outfit. Roy scanned for their minds in the hopes of launching a vicious psychic attack. Cogra Spades smiled as he helped the field surgeon up the rickety stairs of the burning and charred tavern. Upstairs one flight was the healer's shelter, still blessed with air conditioning. It was now a cold 35*. "HEY! I THINK YOU CAN FIND WHAT YOU NEED UP HERE! OKAY?!" Roy gestured to keep his voice down. The kid had killed the 'wolf-man' with a missile launcher from within the tavern below. He'd been blown back out the front door and lost his hearing. A moment later, both were startled to see Cogra's mecha start, seemingly, by itself, and the two weapons prime for fire. Cogra dropped down through the open service door and raced to engage his mech's hijacker and save them both. He clambered up the ladder rungs on various parts of the assembly, and threw open the canopy. A person-sized spider-thing was piloting the mech, and to his horror, Cogra saw that it targeted the healer's shelter with a long range rocket. Cogra saw the life-sensor indicate a flickering sign. A cyborg stirred just below the waves of unconsciousness, as if he should awake any instant and grasp his current reality. Rainmaker cloud routines sprinkled the streets with traces of mirror as seen from Roy's hospital room. Cogra said as he keyed-up 'Rusty' from his remote. The mech had been inspected and fumigated, and cleared for duty. "Why is Coralglass City under attack? And who could it be? I'll find the answers, Roy. You'll see." PBAM's first playtest session resulted in the rapid adoption of the die mechanism, and one very excited 10 year old boy. --Even Roy's player seemed to have fun, and was debating whether to bring him back as the cyborg character he had been discussing before the game. The die mechanism does interesting things with probabilities, with three things being accomplished with one roll. --Super-tools, like mech weapons have very high base damages, but on a human-to human scale, things seem to ring truish enough to not display any apparent lopsidedness other than that statistically expected. ---6 and 7 are the highest density results which create fairly powerful Effect-values (damage, etc. ), but the elusive success-generating feature is indicating that the effect of the full polyhedral set tends to favour the chances of success only slightly, but such higher-power successes pack quite a wallop. ----This models the source materials and overall design premise very well. I am splitting my attention between Small Arms and Equipment, and the Referee's section. Kiddo was hooked as soon as he ogled the AT-43 minis. --I was glad it didn't have movement grids. This is exciting for me, as I have grown very fond of Brett Bernstein's Genre Diversions 3E and related systems over the past few months. My father's death and the two months prior to it, have worn me down a good deal, and I am finding it difficult to resume a normal sleep-cycle, and also feeling a tad bit ill (coldish). --As such, my ability to focus on the re-arrangement of the Players' Manual is virtually nil at present. However, I have been reading several other games, far outside of the mainstream, let alone the 'Renaissance', and I have even found time to play one brief starship combat boardgame, which was a lot of fun even despite my having lost. Yet, I have found it necessary to tinker with game design nonetheless, and am working on a mini-game (not a micro-), the acronymic title of which is PBAM. I will keep this secret until the iteration 1 reveal is ripe. This little project is likely to be about 16-24 pages in length, and I hope to distribute it through my LuLu storefront, and possibly Indie Press Revolution or other pdferies for kleingeld, as it were. --It utilises the standard set of polyhedral dice, but operates more along a Pool mechanic than a d20 or d%-based system. Okay, I'm off for a nap. When the Ancients, the First Parents, fell from the sky in the War in the Heavens, they brought with them a diverse range of martial traditions dating from millennia before, and millions of worlds amid the infinite Empyrean. Because of the haphazard manner in which they tumbled to Urutsk from the great heights of the Space Beyond the Sky <Aya 'Eye-Ah'>, the variety of troops and armed units became so dispersed that individuals or detachment-sized remnants of squads and larger groups simply became associated with enclaves of other survivors. From this jumble of civil servants, constabulary, home guard from dozens of environments, to elite and specialised warfighters, isolated societies cobbled together their individual tables of organisation, training, and deployment as Black Winter set in with its scouring celestial wind of space debris and plasma storms. In some locales, due to the distribution of more favourable geographic features, limited surface activity was possible over the time-forgotten span of the Scourge. However, the vast majority of the scattered Imperial cantons were forced literally underground and expanded their holdings over the centuries. It was not long before the tunnelling unearthed and awakened long dormant creatures and monstrous civilisations as recent as their own, also escaped to Urutsk. These wars, The Onyx Battle , never truly ended. It was only the gospel report of the Scourge's cessation that allowed Humanity to flee the Stygian depths for the sunlit world of the surface. While certain kingdoms and other cultures did meet during that long period, few had the resources to maintain larger communities and had often kept the contact secret from their constituents. Now upon the surface, the enclaves and empires of thirty or more generations removed cousins gradually were reunited. Naturally, the grand traditions of the Imperium made the re-integration of the disparate colonies more easily possible. Of course, there were those who desired no part of the resurrected behemoth that had created the Cataclysm, and from these 'deserters' came the first intra-Human wars. But Fate was kind to renew the enmities with the non-Human, and in some cases, also the Allied Peoples (human-like aliens). More often than not, Human enemies were brought past their bickering and resource grabs to unite briefly against their common foes. 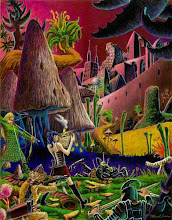 Through these various organic mechanisms of transmission and re-implementation, there became a great commonality to Human military endeavours that was retained as various groups spread out to seed the barren planet with animal and plant life from their long-destroyed homeworlds and others once held within the Imperium's grasp. From the hereditary melange that had defined the Core of the Imperium ('The Sphere of Suns'), as had been recorded in myths of the long vanished past, Humanity became a species of multiple peoples. As the Human pool of bloods split and refined, specialised, and re-introduced other groups, the ethnicities of Urutsk came into being in only a few hundred years. With these divisions, martial procedures changed and were lost to time and replaced with more ideal methodologies and practical measures as suited each group's particular needs. As the planet grew lush and green, as the rains fed the multitudes with blue and white-tipped marsh grains and fattened game animals, in many cases, the non-human races began to find more ideal conditions above ground, and expanded rapidly -- often out-breeding humans by several generations. These groups usually fell upon each other as readily as upon Humans, but in some cases, great bands or more subtle confederacies were formed, and these both were a thorn in Humanity's side for much of the Mad Spring. My father departed the morning of September 9th, 2009. The Hospice nurse said that it was a peaceful passing, and we observed no evidence to the contrary. Since my mother and I are women possessed of faith, and because this conclusion to the spiral of his End-stage Renal Failure was known, we are doing well. --We get that odd shudder when we hear things on the TV that he had a strong reaction to, and as we go through his photos for the memorial, later this month. Sitting at the e-mac we recently purchased him, and realising that he won't be coming back, was a bit surreal, but I have a good feeling that he is in the noblest company of his/my ancestors --nomad warrior-poets, generals, mystics, clock-makers, and educators for generations upon generations. He was Professor Emeritus, French Language instructor; Photojournalist with many shots with his US film idols of that bygone era; and an early adopter of most technologies, and especially those of a film and video nature. He mastered three languages, was fluent in a half-dozen others, and had travelled through much of the Northern/Western hemisphere both on business and pleasure. --He had been chosen by the UN to teach in an African nation (no longer extant), but immediately prior to his making landfall, the nation in question became a Communist state, prematurely ending that position. While no angel, I think that the traits I both inherited and learned from him are singularly wonderful, and after a tumultuous relationship with him for most of my life, we were finally reconciled over the past decade. I believe we shall meet again, in joy. :: This location has sustained enough force or power to render it numb in some areas, and throbbing with pain in other areas. Use of the faculties associated with it are at the above listed penalties (with combat lending the target a +1 to Defence in this case), until such time as the swelling and tenderness has subsided --usually within 24 Hours, or until otherwise healed, if sooner. :: This location's condition is considerably more damaged than merely 'Bruised', and blood-loss is involved if possible based on the nature of the force or power involved, but may be internalised if from some sort of blunt, or intangible source. Use of this location's faculties carries a much stronger penalty, largely making already difficult, or particularly deft or delicate actions that much more unlikely. Healing requires rest and attendance, if only by the wounded individual, especially if one is to avoid infection in Urutsk's humid environment. :: This location has suffered enough damage to break bones, even from non-blunt instruments or sources, and any attempts to use its faculties are penalised to the degree that such actions are almost certain to fail. Healing generally requires outside intervention if the bone(s) are to set properly. Many cases of breaks result in compound fractures, with bones penetrating the victim's flesh, and these have a markedly increased chance of infection due to the exposed marrow. Great care must be given in handling such wounds, and weeks of disuse of the affected location are generally the only means of healing. :: This location, as above, has suffered such extensive trauma, that bones are broken. However, in this degree of impairment, the effect is multiplied many times over, with shards and chips of bone loose in the area, which pose a greater health risk to the victim, as these may lodge in muscle tissue, or even be transported via the circulatory system throughout the body or worse-yet, to the brain. There is no natural recovery from such a degree of damage so as to have the victim fit and whole without medical or other superior methods (magical or psionic restoration, aberrant regeneration, etc.). A number of weeks equal to twice the damage points sustained is a minimum amount of recuperation needed under medical supervision if the location is to regain functionality. :: Thoroughly unpleasant to view, and so painful to sustain as to render the victim almost certainly unconscious, unless the event was explosively fast in duration. As this location is no longer attached to the body, it is certainly possible for the victim to have already expired (as in the case of a detached chest, head, or vitals), or soon to be in that state. Only superior intervention can possibly save the location (and thus, possibly the victim). Months of recuperation are necessary, with a minimum equal to twice the damage points sustained. --I am presenting this system as optional, for those with 'Simulationist' tendencies. ---I may, or may-not be in that camp as regards my own system. Since I use a d8 to determine the location affected, I had to consider the possibility of having a damage-breakdown based upon location. --After a few tries, I have devised the following. It may stand or be revised or be dropped. Location Hits are based upon the figure's (Total DP + Terminal Threshold). That value is multiplied by the percentage decimal and x.5's are rounded-up (minimum value of 1). Each time that a figure's location takes a full iteration of the listed value, one of the circles is filled-in. --If an amount greater than one iteration, but less than two iterations is sustained, the excess is not tracked. Only full iterative values are filled-in. :: Lelt has an Arm value of (2), and suffers 1 point of damage to his arm. This value is ignored. Later, Lelt is struck again in that arm, for 3 points. One circle is shaded. Two hours later, Lelt is bitten by a Tshaum, for 5 points in the same arm. Two additional circles are shaded. Each location has a number of Wound Levels that are reached by having at least one circle shaded in on that level. Once even one mark is on that Level, its effects are in play. I have intentionally not given each location 4 and 5 Wound Levels. I realise that many of you have absolutely no interest in this level of detail, and have strong opinions of that sort. --This post is for those that are interested in seeing what such a system can do. The following is an idea that came to me after reading through Telecanter's Receding Rules site, as an aggregate of his posts, rather than any single one in particular. * As one advances a character, one usually grows attached to that character. When Bad Things happen to that character, but these BTs are recoverable-from, or drive the character on to new directions, this is seen as a Good Thing. But, when Very Bad Things (like non-recoverable death, or loss of Paladinhood, etc) occur, these takes the jam out of the doughnut and is UnFun. Tragic, poetic, but UnFun nonetheless. ^ As one advances one's character, one learns more valuable information about the environment (village, subterranean complex, city-state, region, continent, etc. ), and this Fact-Map become more valuable as more dots are connected. When a character loses a connection (allies turn to enemies, opportunities sour, locations are destroyed or gain new leadership, etc. ), this is a Not Good Thing (not as bad as a Bad Thing, but not as good as a Good Thing). It makes certain resources (info, stuff, spells, etc.) less useful, and may add a vacuum-like effect that time in playing was a waste, etc. 'Suckage' is perhaps an appropriate term. @ When a character dies, they re-start in some other location, perhaps far, far away, with all of their gear and spells/etc. No Boon Suckage, no Data Suckage, just a new grid to explore. In time, and perhaps enough deaths, the character finds a link to a previous 'Dot' on their grid. Jackpot! Their experience (as a character logging Game World Hours) is not lost, their gear and abilities still function, and now, however tangentially, the map has become a little 'smaller' and less obscure. If the above is done on a small-enough scale (city or 'dungeon-level'-sized), it can actually speed-up the exploration process, while still presenting a challenge to the players. Granted, this sort of thing would perhaps best function on a locale-based scale, and would diffuse the Linear Effectiveness of the Party, but if the group is quick on the uptake, the resulting 'Blip-Factor' could present some entirely unique possibilities for both individual character glory, as well as the afore-mentioned Party Boons. --Fey glades, Eldritch ruins, Dimensional cities, Mad mazes, etc., are likely the best usage for traditional Party-centric games. But, for one-player games, this sort of play mechanism may prove useful throughout the entire run of the 'campaign'. A bias against Delver's/CiCi's player has become so pronounced that I am thinking of dropping the game. The LGS owner (now without competetors, as the other LGS has closed for business) and Tybalt's player both acted in a very immature and inappropriate manner that both hurt me in my heart, as well as making me not want to run for them any longer, --at the expense of my SO (Tybalt's player's sister), and Delver's/CiCi's player. --On top of that, due to scheduling conflicts, there don't appear to be any sessions for the rest of September. I am also in a conflict over this weekend's C&C game. --I would prefer to play today, but someone else cannot make it. Sunday is bad for another player, and Monday I would be in conflict with my SO's final session of her mini-'campaign'. But, the real grey cloud is that my father is in hospice, unconscious, and has been estimated at having roughly two months left. --The more-local sister is coming down tonight, and leaving Monday night. What happens next determines whether or not we need to move in with my eldest sister in Boston, MA., or eke out a living here-- if that is even possible. --You see, without my father's SS/income, the mortgage payments exceed our ability to pay, unless we can get a refinancing deal. ---Boston has many advantages in that we would be living with family we feel comfortable with, in a large Victorian, atop a hill. But, I would have to shed my firearms; and, would make things much more difficult to find employment in my field. So, things are kind of...gritty, here. How much further 'til I level-up? --Please, do yourself a favour and see it. Tim Shorts of Gothridge Manor posted THIS. Place episodes in a bag filled with loose particulate crunch (Falling damage, Poison Saves, Trap Avoidance, Fire or Drowning Hazards, Overland Movement/Evasion, etc,) and shake thoroughly until evenly coated. --Remove from bag and place in sandbox. 10-15 minutes later, place notes on a single sheet of lined paper, while allowing sketch to cool on graph or hex paper. Serves up to party of 20. * Stargate Atlantis, MASH, and Wilderness Survival episodes may be freely exchanged with episodes, chapters, or scenes from any other preferred cut of entertainment. I'll be doing much the same, as I've had a rough week, and not much time to work on the Isle of the Slavers. --I have the map drawn and scanned, but my USB network configuration won't allow me to use the WACOM tablet and the external hard drive at the same time, so I have been unable to modify/enhance/colourise the map. ---I have printed out the summary of last week's session to hand my players as a reminder, and I plan on finishing out Round 5's combat In Medias Res before answering any questions. Crafty Sean Wills, inspired by James Maliszewski, has produced the Wheelspins in the Wasteland supplement for Mutant Scavengers of the Ruined Earth!. While I am planning out the revised Players' Manual for Urutsk: World of Mystery, I thought I would give you folks another chance to provide input on what you want to see, and in the basic order it ought to appear. As it stands, I am reworking the distribution of the background material (keeping the initial description in front, but pushing the timeline after the rules); unifying the Character Generation process (while still maintaining the Point-Design system as optional); and making certain that explanations appear in their proper and logical spots (the effects of a Sever result appearing in Combat, rather than in the weapons section, for instance). 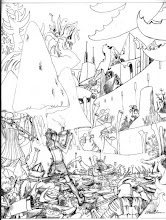 Die Rolling Conventions; Basics of RolePlaying (perhaps three pages); Glossary. --Is there anything else I ought to know/do? 2). I produce an art-light version and then re-release it once all of the art is in. After my initial good reviews of Mutant Scavengers..., I am thinking about producing an UWoM-centric version as a quick-play version of the rules for pick-up/one-off games, and releasing this separately and before the PM goes 'live' for .pdf and PoD sales. I was slightly derailed by a need to write a Gamma-style variant of Nicolas Dessaux' Searchers of the Unknown 1-page micro-game. Mine is entitled MUTANT SCAVENGERS of the RUINED EARTH!, and was equally inspired by Sean 'bite the bulette' Wills' Scavengers & Spacewrecks extension of SotU. --In fact, I think that playing a combined game of S&S and MSotRE! only increases the fun-factor. One could easily argue that Sean's CYBORG SAMURAI ARE GO! extension is the prequel to both S&S and mine, timeline-wise. Or, perhaps the new home of humanity, Light City, is on another planet, and the occasional Spacewreck Scavenger team beams down to the Ruined Earth to salvage old-world tech, and bring home bio-samples from its mutant population.